Checkpoints, closures, curfews and the bureaucracy of permits and licences that back up these measures have long been the tools that facilitate the Israeli occupation of Palestinian territory. However, since September 2000 the system has been intensified, ‘industrialised’ and, increasingly, brutalized. This article will make the point that the very existence of this massive scheme of obstacles, even when no physical or verbal abuse are perpetrated there, is in itself an abuse of a fundamental human/civil right: freedom of movement. More than this, allegedly a necessary security measure, the checkpoints are in fact instruments of control and humiliation of a civilian population and the paralysis and disruption of their economy and society (World Bank, 2007). Checkpoints are a tool towards Israel’s realisation of maximum territory with a minimum of Palestinians; yet another element in the ongoing system of population transfer that began with the Naqba-Disaster of 1948 and that continues, by various means, up to the present time. At the onset of the so-called Al-Aqsa Intifada, which rapidly became Israel’s all-out war against the Palestinians, the Israeli Left suffered a major crisis. For many, this was the moment of disappointment with the Palestinians, who ostensibly rejected former Prime Minister Barak’s (ostensibly) generous offer. For others, it was yet another moment of impotence in the face of Israel’s escalation of violence and oppression of the Palestinians. Amidst the cries of ‘what is to be done?’ a group of us, all women, decided on a small but rather revolutionary step. We would challenge Israel’s sacred cow of military supremacy and omniscience by monitoring the behaviour of the military at checkpoints. Our decision was stimulated by reports by journalist Amira Hass. She regularly featured the abuses perpetrated there by soldiers; particularly the cases of pregnant women denied passage and forced to give birth amidst the dust and dirt of these obstacles. MachsomWatch/CheckpointWatch (MW) as we called ourselves, began its observations with a handful of women. Subsequently, our consistent presence in the field has made us bearers of knowledge, a knowledge usually reserved for the security services. This is data not only about the existence of checkpoints and their attendant evils: denial of mobility permits, non-access to medical care, police harassment. It is also the understanding of the whole system and its varied applications and purpose. Since that February day in 2001 when we made our first foray into the unknown arena, the organization has grown to include some 400-500 women, covering over 40 checkpoints along the Green Line and within the West Bank. Working in groups of 2-5 volunteer women, 365 days a year, morning and afternoon, MW has the most consistent presence in the Occupied Territories of any activist group. After each observation a report is circulated by e-mail. A weekly digest is widely distributed to NGOs, journalists, political figures and the interested public in Israel and abroad. Although successful in organizational terms, MW has nevertheless not succeeded in removing a single checkpoint. While often extending help, respite or sympathy to individual Palestinians, observers must consider the following dilemmas: is our activism helping to obscure the brutality of military oppression, are we a fig-leaf for the Occupation? Does our interaction with the military, ambivalent both at the practical and the effective levels, make us complicit with the Occupation? These issues are however beyond the scope of this article and are addressed at length in my book, CheckpointWatch: Testimonies from Occupied Palestine (Zed Books, London, 2006). My point here is that MW has amassed a body of testimony that bears witness not only to the, all too frequent, ‘exceptions’ of physical and verbal abuse of Palestinians, but also to the abuse inherent in the very routine of these control posts that disfigure the landscape of the West Bank and disrupt the lives of its 2.7 million besieged inhabitants. This article draws on my own experiences as an observer as well as on the thousands of MW reports amassed over the last six years. But what of the checkpoints themselves? To give the reader some notion of the scope and mass of these obstacles: here are some statistics. The situation on the ground changes from day to day, even from hour to hour; nevertheless, these figures reflect an ongoing situation that certainly has not improved with time. These figures include 6 ‘terminals’ on the Green Line – permanent structures where access and egress are by means of biometric parameters (handprints, photographs, finger and eye prints) in addition to the usual system of ID cards, permits etc. (Kirstein-Keshet, 2006). Staffing at checkpoints varies; some are open for 24 hours, some for 12, others only intermittently. The staffing may be military or, at some terminals, by private security companies under military supervision. There is seldom an adherence to the promised hours of opening and unstaffed checkpoints must be negotiated by scrambling over the obstacle or taking a long and arduous route to circumvent it, or by simply not crossing. It takes little imagination to realise what this means for the disabled, the pregnant, the aged or the very young. The locking of villages at night obviously means that medical emergencies cannot be addressed in real time. More than this it is an outrageous insult as though peaceful civilians were wild animals to be caged in their own homes. This measure does not serve Israeli security needs, but is convenient for military incursions into the villages in search of alleged terror suspects. It is also a very clear message of control and collective punishment, as though that message were not clear enough! To the above must be added the 700 kilometres of road from which Palestinians are banned and the fact that the strategic location of the checkpoints enables Israel at will to rapidly divide the West Bank into three separate areas and to prevent movement between them. Furthermore, the strategic placement of settlements and their outposts combines with the location of checkpoints to reinforce the cantonization of the area. From all this the reader may begin to realize the incredible limitations the individual Palestinian faces in attempting to go about her/his daily life: to work, to school, to medical help, to visit family or friends – the latter almost an unthinkable luxury. This without mentioning the curfews, extended closures – prevention of passage – imposed during Jewish holidays or because of terrorist ‘alerts’. Over half the permanent checkpoints, and all the other barricades mentioned, are within Palestinian territory and do not offer direct access to Israel. Along the so-called Separation Barrier/Annexation Wall conditions are no better since this is of course the ultimate checkpoint. Despite various ‘alleviations’ in its route – mostly cosmetic – the Barrier causes tremendous human suffering, splitting families and preventing access to farming land and to services of all kinds, The situation is particularly acute around Jerusalem where the Wall has seriously disrupted social, commercial, educational and medical ties with the city. (Klein 2003a, Kirstein-Keshet, 2006:pp89-104). The ecological damage caused by the erection of the Barrier is also tremendous. With farmers unable to reach their fields the crops spoil. Thousands of trees are uprooted to make way for the juggernaut and flora and fauna are destroyed. A journey through the West Bank in 2007 is a journey through a landscape raped and despoiled. Throughout the West Bank, areas that once hummed with life and activity are now desolate; the Palestinians have almost disappeared from sight – who leaves home now unless they have to, or are among the lucky few with permits to enter and work in Israel? The question remains: what, or who, are served by this almost total paralysis of a whole population? The answer undoubtedly lies in Israel’s desire for dominance, in the greed for land and water and for ‘sterile’ territory around the settlements, enabling both their expansion and their ‘security’ Naturally, the settler population is heavily armed and each settlement boasts a considerable arsenal An armed Israeli is allegedly defending himself, an armed Palestinian is considered a terrorist. Or perhaps the checkpoint begins at Osama’s coffee stand. Osama who hasn’t left his village for seven years because Israel refuses … him a Palestinian ID and he is a displaced person in his own birthplace, subsisting on the pennies that the taxi-drivers give him for his coffee. And perhaps it ends with his four children, and the children of the dozens like him whose parents cannot support them because they are trapped in their villages. Or perhaps the checkpoint begins at Beit Dajan, at the home of an old lady, and ends at the house of her grandchildren who live only four km away, at Sa’alim, but whom she hasn’t seen them for years because Sa’alim residents cannot pass the checkpoint … and she hasn’t the strength anymore to undertake the journey herself. Or does it begin at Beit Furik at the home of the four month old baby with heart disease, whose parents live in constant fear that his heart will betray him in the middle of the night and they will find themselves waiting in vain opposite the closed checkpoint… and does it end in the morgue of the hospital in Nablus with other residents of Beit Furik and Beit Dajan who didn’t receive the necessary medical care in time because of the checkpoint? One fine day we set out to film at the Beit Furik checkpoint, the atrocity was there, waiting for us, patiently, accustomed to suffering. Only its faint shadow was captured by the camera lens (Merav Amir, 15 May 2007). Merav goes on to suggest, with reason, that the checkpoints begin, and end, with Israel’s policy-makers, military and political, and with the indifferent Israeli public that refuses to recognise the humanity and suffering of the Palestinians. ‘Welcome to the Gateway to Hell’ was the unforgettable greeting accorded us one day by a young man at Qalandia checkpoint, on the road to Ramallah. And hell it is. Like Merav’s camera mentioned above, this paper can only provide readers with the merest shadow of the checkpoint experience. Arriving at a checkpoint, the would-be transitee/observer is confronted by soldiers with cocked guns facing the line of waiting pedestrians. People mostly stand in stoic silence. If the crowd gets impatient and begins to surge or straggle forwards, it is herded back with shouts and curses to some arbitrary point, sometimes encouraged by shots in the air, sometimes by tear-gas and stun grenades. If soldiers feel provoked or threatened, they may respond with live fire, not infrequently with fatal results. Advancing to the examination point, documents are checked. Checks may be cursory or thorough. The transitee may stand 10–20 metres from the soldiers, or suffer intimate examination. Men may, or may not, be asked to bare their chests and bellies and execute a pirouette to prove the absence of weapons or explosives. Women may, or may not, be required to undergo a more, or less, discreet body-check by a woman soldier. Women and children may be passed ahead of the crowd, or forced to wait in line. There may, or may not, be a ‘humanitarian’ line for ambulances and medical cases. This may, or may not, be open. The variations are unpredictable and endless. If a terrorist alert is anticipated, or if the commander simply decides to punish the waiting crowd (or MW observers! ), a procedure known as ‘Cessation of Life’ is introduced – literally, the checkpoint comes to an indefinite standstill ; no one crosses or returns until it pleases the authorities to declare that ‘life’ may begin again. In the way of things, much special pleading goes on at the checkpoints – by Palestinians themselves or, often, on their behalf by MW observers. Since even medical cases require a permit, and since one naturally cannot always know in advance that one will be taken ill, many of the instances in which soldiers are asked to use judgement and leniency are medical. All too often these legitimate requests go unheeded although thanks in part to MW activities, the army has established a hotline for such cases. Sometimes, it even works! There are bizarre incidents too such as the case of the dead man at Abu Dis who, after observers persuaded the guards of his harmlessness was allowed to cross with the stretcher bearers, even though ‘he’ had no permit. However, at the hi-tech terminals, soldiers are protected in armoured glass booths, inaccessible to pleading or persuasion. Here there may be as many as five examination points and if the biometrically operated technology fails, you are stranded for as long as it takes for someone to deign to release you. You had an appointment? An urgent medical issue? Too bad for you. There is also a lexicon of checkpoint terms, terms familiar no doubt in many other contexts. Here they take on a particular meaning. This terminology – Checkpointspeak – creates the situations, recreates the identities of individuals who were once agents of their own destinies. Permits: No Palestinian may enter Israel without the appropriate permit whether for work, business, education or medical care (MachsomWatch/Physicians for Human Rights, 2004). The acquisition process is Sisyphic, or rather a multi-stage game of snakes and ladders: the applicant scores one success, only to be plunged back to the beginning of the process at the next stage. Reasons for refusal are not divulged or are subsumed under the category of ‘security reasons’ – which may mean anything. The permit system has in fact always been a prime tool for the recruitment of collaborators and informants. (Hass, 2002a, 2002b, 2007). Yet possession of a permit is not a licence to pass, you can still be denied passage – on the mere say so of the soldier at the examination point. Detainees: A common sight is the groups of detainees, held while their documents are checked by radio with some distant General Security Services (GSS) computer. Detention is part instrumental, as a search for suspects or forged papers. It is also part punishment whether for daring to desire passage in the first place, or for ‘being cheeky’ to a soldier or some other infringement of an unspecified code. Sometimes it is a punishment just for being a Palestinian. In blazing heat or freezing cold, with little or no shelter or toilets, detention may last minutes, a whole day, or even overnight. Most detainees are released sooner or later without charges being brought. Young men are particularly vulnerable. Not only are they seen as likely militants/terrorists, they too are considered ripe for recruitment to the vast web of collaborators and informers that Israel has nurtured during the years of Occupation. Suspects: In Israeli eyes all Palestinians are a-priori suspects. The term covers a multitude of identities, from a fully fledged militant or minor political leader to a relative of another suspect. Or, once again, a potential source of collaboration. There is a lack of logic here. For a serious militant/political leader is no longer a mere suspect, but is already convicted and will be on Israel’s hit list of targeted killings or on a list of wanted persons to be hunted down in military raids. Once arrested, on whatever grounds and regardless of being found guilty or not, an individual has a ‘security record’ ending all hope of obtaining a permit of any kind from the authorities. Illegals: Workers attempting to enter Israel without a permit. If caught, they and their employers are subject to heavy fines. The worker may also serve a prison sentence – another sure farewell to any future permit being granted. The lucky individual, who passes the checkpoint, may yet be stopped on the other side by the civil police. Do you have unpaid parking or speeding fines? Crimes and peccadilloes not accounted for? This is the opportunity to atone for your sins. There is a truly unbearable lightness with which any Palestinian can be fined, detained, arrested – or killed. As a result of all these restrictions the thousands of Palestinians, once the primary source of cheap, manual labour have disappeared from Israeli streets and construction sites. They have also disappeared in the West Bank itself. 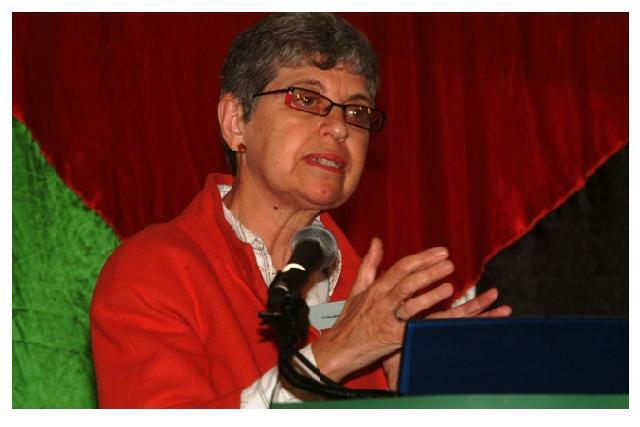 More and more one reads in MW reports about the ‘invisibility’ of Palestinians. 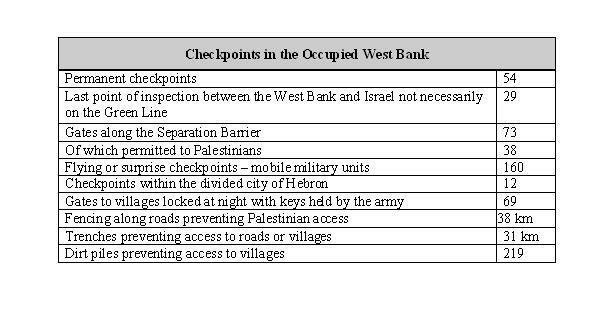 As stated, the majority of checkpoints offer no direct access to Israel but lie deep within Palestinian population centres. In the heart of the West Bank between villages relying on access to the nearby Palestinian city of Nablus for services, there are a whole slew of such barriers. Nablus is the site of the biblical city of Schem. Both because of its religious associations and for the political purpose of ‘Judaizing’ the area, many Israeli settlements have been established there, among them some of the most radically messianic (Eldar and Zartel 2004). Here is one account of one such checkpoint. On the edge of Route 60 … is a large signboard commemorating those who fell in defence of ‘The Land of Schem’ and alongside it a quotation, ‘Open my Eyes that I may See the Wonders of Your Torah’ (Psalm 119: 18) … yet any one of those few who read the sign correctly and who respond by opening their eyes in the fullest sense will look and see the iniquity – whether to God or towards their own common sense – that has covered that land and its environs with the concrete checkpoints, earthworks, ditches and improvised structures. Here, little bands of soldiers wander around sweating in their helmets, like strange mushrooms under the brownish-green nets that cover them and camouflage them from goodness knows who. … you will see that at that crossroads a sign points you in the direction of Itamar and Elon Moreh [settlements]. Go a few miles up a smooth road beyond the road leading to Itamar and before long you will see an unsignposted Arab [sic] village, Beit Furik. To your left, in the heart of a desolate stretch of land, you will see concrete cubes, an Israeli flag on a small rocky hilltop and on either side cars and hundreds of people desiring … to go from Beit Furik to Nablus/Schem or vice-versa. After many minutes during which you will not see any movement in the empty zone that separates each group, perhaps a solider will pop up and gesture with his hand to someone or to a car to approach for checking. One by one, very slowly, one from this side, one from that side. It is the misfortune of Beit Furik that the road from there to Nablus intersects with the road leading to Itamar and Elon Moreh. Residents cannot therefore come and go from their village without getting stuck at this out-of-the-way checkpoint for untold periods of time. With them too are trapped the residents of other nearby villages [Sa’alim, Bir el Hatab and Azmut] that from here look deserted, bordered at either end by uneven dirt tracks, only metres from the fine asphalt road that serves the settlements. And if you have already decided to look, perhaps you would also like to listen to some of what is said at one of these checkpoints in the Land of Schem. For instance, at nearby Huwwara: ‘You, what do you want in Amman?’ scolds a skinny soldier his very young face streaming with sweat, to a plump man with a large suitcase. ‘What’s wrong with Schem?’ And to a woman holding a large bag: ‘Tell me, what have you got here, you?’ and he draws from her bag a small plastic object of uncertain purpose, waving it around for all to see, just a joke. He laughs and sticks it back in the bag. With that, the security check is over. ‘Git off’, he hurries the woman who has frozen for a moment…He doesn’t notice a few people sneaking by from the side. These are just a few of the things that I saw one Saturday in the month of August 2003. No abuse, and no atrocities but the routine of military and police activity so that anyone coming here, just 40 minutes’ ride from Jerusalem, will find themselves more concerned for their security than they were before. Maybe there are no explosive belts here but the disruption of the lives of ten of thousands of people, day in day out, creates a whole stockpile of explosives. ‘Open my eyes that I may see the wonders …’ (Ilana Hammerman, 23 August 2003). And four years later, in May 2007, we find that nothing has changed. A vicious circle is defined as one thing/trouble leading to another that then aggravates the first. It’s a simple way of looking at what goes on in the Occupied Palestinian Territories, from the macro – as violence has subsided, the number of roadblocks has increased — 44% more in 2006 than in 2005; or, from the micro – a Palestinian woman at a checkpoint, standing tall and proud, having her bags thoroughly checked by a soldier trying to humiliate her dignity and, failing, taking out his/her own frustration on the next Palestinian, reinforcing the hardships he/she already has to endure. 13:10 — a Palestinian woman waits for a lift, inside the Green Line, She, with her packages, gets into our car, and a short while later, she calls out to her son and his friend, already walking towards the Territories. They, too, get in the car, and on the way to the marked settlement of Zufim, the approach to unmarked Qalqiliya, where they live, we hear of the illnesses of children and of needed treatment, PHR (Physicians for Human Rights) numbers are handed out and they extend the usual coffee invitation. 13:40 Deir Sharaf: At the grocery store, we hear again, at first hand, of the owner’s dire economic circumstances, confirming the recently released report of the World Bank: the Palestinian economy is in a crisis from which it cannot emerge … The practical effect of this shattered economic space means an individual like Jamal cannot pay his suppliers what he owes from the time when a military checkpoint prevented access to his warehouse supplies which were, consequently, ruined. Beit Iba:14:45 — the bag checking is today ever more invasive. One soldier, plus pointed gun, and the military policewoman, who also carries the GSS list in her hands, insist that bags not only be poked but that they be entirely turned inside out, even when empty! The whole system is inefficient as well as humiliating, since often people’s IDs are checked twice, or they are called back, with shouts, when one of these two thinks that they’ve not been checked. 15:00 – there’s a detainee already in the detention compound when we arrive, and since nothing seems to be happening…we ask what is going on: as he tried to get around the checkpoint: he’s being held ‘for the time being.’ ‘Have the police been called?’ we ask. ‘No, I’m the policeman of the checkpoint.’ Vicious circles or cycles, whatever (Aliya S. and Susan L., 13 May 2007). From all the foregoing it is clear that the checkpoints and closures serve no real security purpose but are the deliberate means of control, of containment – it is no exaggeration to say of the imprisonment – of the entire Palestinian population. For all Palestinians, every aspect of the checkpoint is a collective punishment, an accumulation of stress, humiliation and real physical suffering. You leave home in the morning for work, errands, school, family visits, and within a short time you are scrambling over barriers, playing hide and seek with the armed forces in fields, and arrive at the checkpoint hot, dirty and clutching your ID card. Will the masters of your fate smile and wave you through? Will they add insult to injury by name-calling, beatings, tear-gas, shots? Will the checkpoint suddenly close for no apparent reason, leaving you stranded on the wrong side, even overnight perhaps? You never know what will trigger which response, and yet there is no choice but to pass through this gauntlet of hostility and contempt to in order reach your goal. Your time, your space, your life, your freedom to worship, to love, is no longer yours to call your own. You yourself have become a suspicious object. The system is both a function of, and a means to, the demonization of that population. Palestinians, men, women and children, are ipso facto terrorists in Israeli eyes, devoid of human feelings and needs. The demonization is so widely accepted that transfer, or the relocation/banishment of populations, is now openly proposed by parliamentarians and discussed in the media. Nor are Palestinian-Israelis exempt from that prospect in popular discourse. So where indeed do the checkpoints begin and end? Perhaps in the indifference of the international community via Israeli intransigence through to the agendas of Washington. Perhaps they simply begin with the banality of evil: we do it because we can. The facts presented here, and elsewhere, are common knowledge, publicised in the Israeli press and media as well as internationally. Reports from bodies as diverse as Human Rights Watch, the United Nations and the World Bank over the last 6 years constantly reiterate the deleterious effect the checkpoints have on Palestinian society and economy, but alas, the more things change the more they remain the same. As to MachsomWatch, it has, indeed, not succeeded in demolishing a single checkpoint, and there is no doubt that its work is not unproblematic. Having lost its radical edge over the years, the organization has become more of a humanitarian venture, presenting as it were the better face of Israeli society. However, the testimony produced is invaluable. To discontinue the observations would be unthinkable. To do so would be to abandon conscience, to be silent in the face of iniquity. As to silence, we do not hear here or elsewhere the voices of the Palestinians themselves. Their voices are not heard, and if heard often not granted credibility. I cannot presume to speak in their name but I would like to suggest that their stoicism and endurance at the checkpoints is an act of courageous resistance. It is tzumud – the determination to cling to life and dignity in the face of those who would rob them. We, who watch with them, can only marvel. Hass, A. (2002a) ‘Israel’s Closure Policy: An Ineffective Strategy of Containment and Repression’, Journal of Palestine Studies, 31 (3). Towns such as Qalqilya and Hebron have seen the massive departure of their citizens as a result of the difficulties imposed by the checkpoints and, in the case of Hebron, because of unchecked settler violence. Although the term is usually associated with mass killings of populations, in the context of the Occupied Palestinian Territories the combination of oppression and containment of a civilian population, the denial of their most fundamental rights and the frequent killings of individual Palestinians, armed and unarmed, seems to me rather to add up to ethnic cleansing. Since September 2000 over 50 women have had to give birth at checkpoints when denied passage. At least 15 of the babies born there died. Courtesy of Btselem, the Israel Information Centre for Human Rights in the Occupied Territories, online December 2006. All reports are edited for reasons of space while preserving their content and intent. Like most Palestinian towns and villages in the West Bank, present-day Nablus predates modern Israeli settlement. Tzummud (Arabic): A close and relentless attachment to the land..
Yehudit Kirstein Keshet is an Israeli writer and anti-occupation activist. Together with two other women she is co-founder of MachsomWatch/CheckpointWatch a voluntary women’s organization monitoring military checkpoints along the Green Line and within the Occupied West Bank. Yehudit has recently published a book about the checkpoints: CheckpointWatch: Testimonies from Occupied Palestine (Zed Books, London 2006/Palgrave MacMillan 2006/Nautilus Press, Hamburg,August 2007). She is currently working on a series of novellas about memory – and forgeting – in Israel-Palestine.